Growing garlic in your garden is one of the easiest things you can do! Cultivated since ancient times, garlic receives mention in the Book of Numbers in the Old Testament, and is one of the easiest crops to grow. Many cultures developed their own varieties, such as southern Europe, eastern Europe, and Asia. When I purchase garlic at the supermarket, I buy it by the pound. We eat it in everything, and I quadruple the quantities specified in the recipes. Well, nearly everything. My family isn’t yet receptive to the idea of garlic ice cream. Last year, we planted seven varieties of garlic with fabulous results. Why plant your own garlic? Garlic stimulates the lymphatic system, acting as an immunity booster. It also acts as a natural pesticide for your other plants. Most intruders in your garden won’t eat garlic, except maybe the human kind. I hope you don’t have many of those. It takes up very little space to grow and store. There are many more varieties than the California White you see in the store. Many more. Store-bought garlic is already a little old by the time it gets to you. Freshly cured garlic is incomparable. If you like the variety you’ve grown, you only need to purchase seed once. Now is the time to think about growing garlic for next year’s crops. It’s important to plant your garlic on time, but it’s more important to order on time. Seed companies sell out fast, especially those that specialize in some amazing varieties. Growing Garlic: Can you Plant Garlic Purchased from the Store? The best answer I’ve heard to this question is, “Yes, but why would you want to?” Because of its natural insecticide qualities, garlic has very few natural insect predators. Therefore, it’s extremely easy and cheap to buy organic garlic. However, most garlic offered in stores is California White, and it’s very mild. I can cut into a fresh clove, lick it, and walk away unscathed. This is great if you don’t like flavor. If you like a bit more body to your garlic, you’ll want to plant anything but California White. California White is good if you have no other options, but I often use 4x the amount a recipe calls for. Italian Purple can be eaten raw, but has a slight kick. If you use it raw, use it with Greek food where you want that pungency. Mellow and sweet, Music is delicious when used raw for guacamole. Delicious and absolutely adorable when braided, Inchelium Red makes great gifts. Russian Red, my husband’s favorite, has a distinct tang that reminds me a little of copper. Though this garlic is often too powerful to eat raw, it’s excellent roasted. Use it in recipes where you really want to focus on the garlic. The huge cloves of German Extra Hardy smell fabulous, and easily chop into chunks for sauteed dishes or slivered for Moroccan tagines. German White peels easily, so easily that a bundle of it fell from my wall and the peels shattered right off. I didn’t want to waste it, so I immediately made fabulous garlic salt. German White is excellent for garlic salt. Georgian Fire, the saffron of my garlic arsenal, causes actual pain if eaten raw. I save this for Indian food, where I want a powerful punch. Most garlic varieties are heirloom. Because of the nature of garlic, it’s not necessary or even that practical to create hybrid garlic. So which garlic should you buy when you’re growing garlic? It depends on which you’re likely to eat. Don’t buy Georgian Fire if you like your garlic raw and have a job where you work in close proximity to other human beings. Also, pay attention to recommended growing conditions and your particular planting zones: if you live in a cold area with harsh winters, try to buy an Eastern European variety. Southern climates would probably do well with Spanish or Italian garlic. Growing Garlic: Where to Buy Garlic? Some top seed companies may be unable to ship garlic to specific states, such as Idaho or California, so check with the company before ordering. The seed company website should specify if they cannot ship to you. Maine Potato Lady: I ordered most of my garlic from Maine Potato Lady last year. Her garlic and potatoes are of exceptional quality. However, because this is such a small business, and due to variations in the growing seasons, her selection often changes. Shipping is much slower than the website promises. Territorial Seed: I’ve never received bad product from Territorial, and the $7.50 flat rate shipping makes it ideal for bulk orders with friends. You’ll find many varieties of garlic over there, but much is already sold out, so hurry up! Boundary Garlic Farm: Though I’ve never ordered from Boundary Garlic Farm, I’m impressed by the variety and the descriptions. They even detail how their garlic fared in this past cold/wet spring. Experience has proven to me that the best markets for specialty items like garlic are the farms that deal exclusively in that. I assume that you’ll receive superior grade garlic from this farm. This is a Canadian farm, though, and export to the U.S. is very limited. 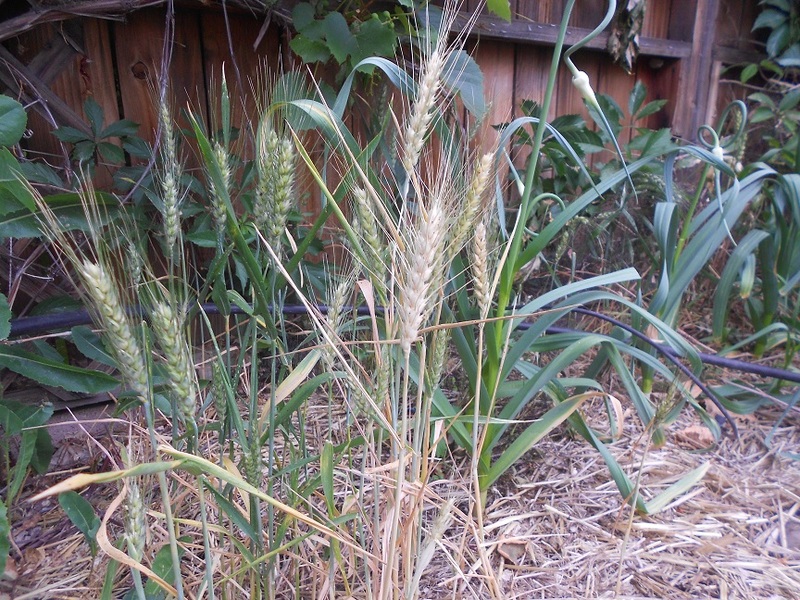 The dangers of mulching the garlic patch with wheat straw. Here, chickens! Garlic needs to be in the ground before the first hard frost of the fall. In Reno, that’s by the end of October. In northern Idaho or Montana, you may need to plant sooner. Because garlic needs a long season, and this cold period, spring planting will not be successful. Garlic makes a great garden border. You can plant it in the furthest, most inaccessible areas, because such little maintenance is involved. Also, consider using it as a crop divider, to frame other vegetables. If you’re really crazy about garlic, just plant a huge swath of it across the landscape. Choose a spot that receives full sun and can remain undisturbed for almost an entire year. Loosen the soil about 6 inches deep, and fortify with compost and/or aged manure. Separate garlic cloves (do not peel!) and insert, pointy-side up, into the soil with 2-3 inches of dirt above the top of the clove. Mulch heavily with straw, leaves, or dry lawn clippings. If you live in a cold climate, add more mulch. Even more. (I added over 6 inches of straw.) If you live in a windy area, or you allow your chickens to roam your garden, weigh the straw down with something heavy but permeable, such as tomato cages or old trellises. Water well for a few weeks, but not after the first hard frost. When that frost happens, just sit back and relax for a few months. Before it’s even time to plant snow peas, you should see little green blades emerge. Don’t worry about pulling back the mulch. 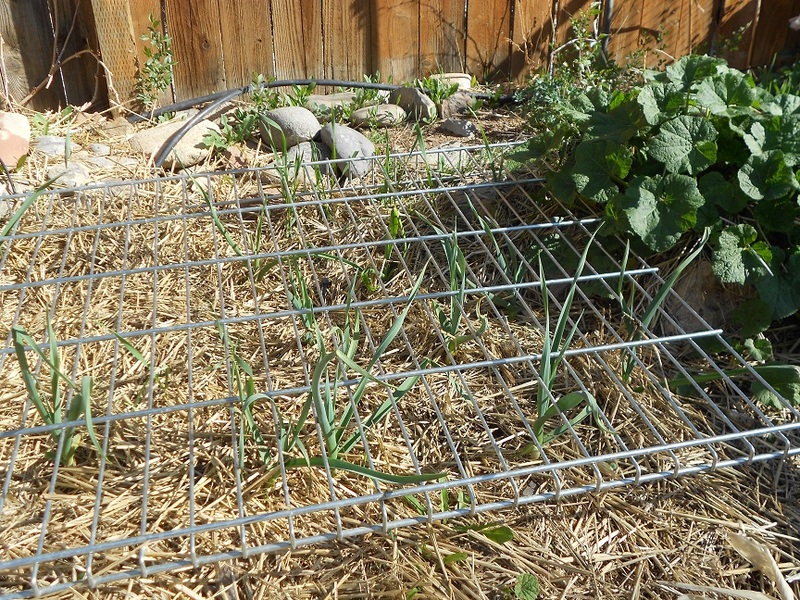 The garlic will grow right through it, and the mulch will continue to hold in moisture during the hot summer. Remove anything that might hinder growth, such as the weights you put on your mulch. Start watering moderately. Have you tried spring garlic? It looks similar to a green onion, and has a much milder flavor than mature cloves. Consider pulling a few plants early and adding it to stir fries and soups. Or just save every last bit of it to mature in the fall. Keep watering as normal, until almost all of the leaves on your garlic are brown and dried. If you planted in October, this should be around July. Since I planted 7 varieties, mine matured at different rates but was all ready to harvest within a three-week time frame. Bunched according to variety. Don’t we look all Tuscan now? 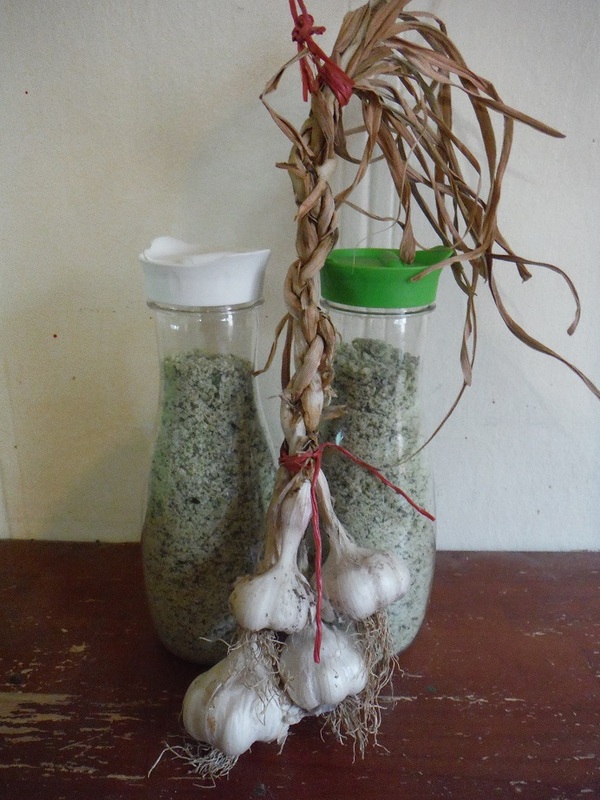 Growing Garlic: Curing Your Garlic, So You Don’t Waste A. Single. Clove. Gently remove dirt from the bulbs. Feel free to wash off any garlic that you don’t want to replant. Leave the roots intact, as these help moderate the drying rate. Bundle heads together by tying or braiding the stalks. Hang in a dry area. If you live in a humid climate, you’ll probably want to choose a closet or a basement. I have no problem with humidity, so I hang mine on my dining room wall. It makes an adorable pastoral decoration, and the garlic is handy whenever I need it. Use within a short time any garlic that has been bruised or cut. If you have a lot of damaged garlic, make a large batch of garlic salt. 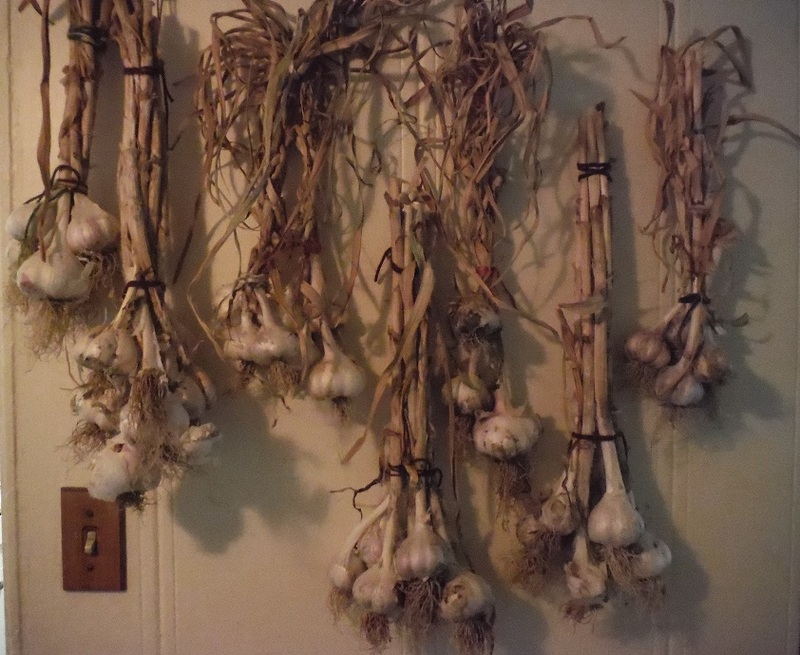 Place the garlic in labeled paper bags, mesh bags, or horticulture boxes. Check in on your garlic from time to time. If you see cloves start to deteriorate, pluck those out and use them. Do not allow bad cloves to remain with your good garlic, or they might corrupt your pure, innocent bulbs. First of all … resist the urge to give those huge, beautiful heads of garlic to your friends! Save your very best heads for replanting. The best cloves will produce the best new bulbs. 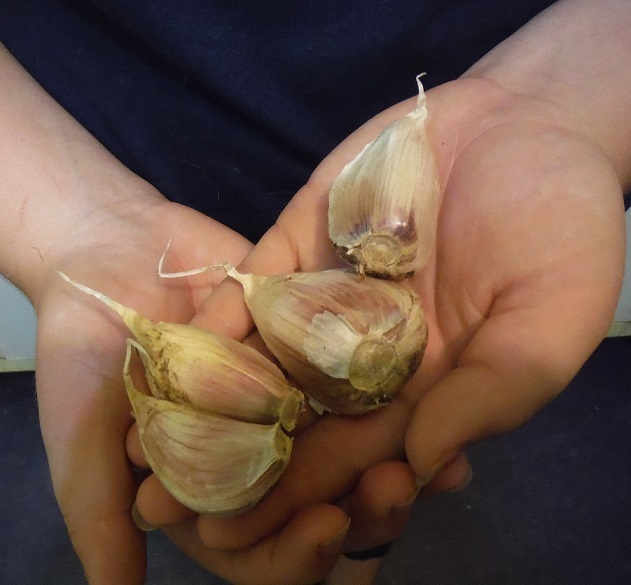 Select your seed garlic, and use the smaller bulbs for cooking. They taste just as good, anyway. Once the garlic is cured, store the seed in a paper bag, away from direct light. Do not place this in the refrigerator. Remember to plant these before the next hard frost! It’s garlic. Plus salt. Really, it’s that easy. Kosher salt, sea salt, table salt. It depends on how much you want to spend, and how pure you need your garlic salt to be. Equal amounts of fresh garlic. One clove equals about a teaspoon of salt. Fresh herbs, if desired. Parsley and basil taste fabulous in garlic salt. Oregano and marjoram are also good ideas. Grind down your garlic and herbs. Mix it with the salt. Pack it, moist, in airtight jars, or spread it out and let it dry. Last month, I ground my garlic and herbs in my 130-year-old food grinder, mixed in the salt, spread it on cookie sheets, and went on vacation. I came back a week later, crumbled up the salt, and gave some to friends. Because of the antimicrobial nature of salt (it’s been a preservative for millennia), you don’t need to worry much about contamination from letting it air-dry. Just shield it from debris or anything your children might flick into it. If it doesn’t seem to be drying in time, place it on a cookie sheet in your oven, on the lowest temperature. Or cure it in your dehydrator. Then store it in mason jars or recycled shaker containers. Do you have a favorite variety of garlic? What tips do you have for growing garlic? Please comment! a, and, best, chicken, cold, compost, cut, dried, experience, flowers, for, free, fresh, fresh herbs, garlic scapes, growing, growing garlic, hardy, herbs, homemade, how, how. to, in, last, long, make, manure, most, natural, natural insecticide, oven, plant, planting, planting zones, plants, pound, recipe, soil, straw, that, the, to, tomato, what.